If being the owner of a lawn care agency has taught me anything, it is that lawn mowers are one of the most difficult gardening tools to buy online. And my friends often ask me if the mowers that they are planning to get will be able to cater to all their yard care needs. Well, more often than not they don’t. Yes, they might promise fantastic features and utility in their online reviews, but when put to the test they somewhat disappoint. And even though I might be an easy man to please, when it comes to selecting my gardening tools, I make no compromises. It’s rather rare for a lawn mower to be able to tick all the boxes on my checklist, but the Ariens IKON-X 52 Zero Turn Mower does just that and more. And I am confident that it will appeal to you the same way it appeals to me. What about the IKON-X 52 Zero Turn Mower that disappoints? What about the Ariens IKON-X 42 that could have been better? What are some of the things that can be improved about the Ariens Apex? The IKON-X 52 Zero Turn Mower has been my go-to for a long time now. And what makes it so special and slowly grow as my favorite, is its extremely user-friendly build and fantastic versatility. Needless to say, I was able to use it for multiple jobs. From pruning the yards of old age homes to large extensive golf courses, the mower has yet to let me down. The best part about the IKON-X 52 is how it’s effortlessly able to make short work of the most challenging mowing jobs. Take a golf course for example. Not many mowers of its class will be able to take on a task of that range; either they would run out of steam or their cutting speed would diminish over the course of the day. But the IKON-X 52, on the other hand, comes with a 23 HP, 726 cc Kawasaki FR V-Twin Engine which is significantly more powerful than the majority of its competitors. This makes trimming even the biggest yards feel like a breeze, and my mowing time is cut down by almost half. Not all trimming jobs are the same; from community parks to school football fields, the length and height of cutting the grass for each are different. And the ideal mower is defined by how versatile it is and how effortlessly it manages multiple trimming tasks. If my experience is something to go by, then it can be safely assumed that the IKON-X 52 is indeed one of the most versatile mowers in today’s market. Its fabricated deck comes with 3 blades that have a dial-operated cutting height selector. As it effectively does away with the age-old “pin and lever” process, setting the exact cutting height is now made more accurate. And along with the improved foot operated deck lift, the mower allows 13 cutting height positions ranging from 15 inches to 4.5 inches in small increments. Durability and ease of use are another essential aspects of the IKON-X 52. The fact that the mower is capable of catering to both professionals and amateurs alike is what makes it so popular among all gardening tool enthusiasts. It comes with twin EZT hydrostatic transaxles which improve the response time and makes controlling the trimming process significantly more manageable. And for superior deck stability, the dual arm lift is given a commercial grade design which contains a 4-point hanging system allowing the blades to cut grass evenly. 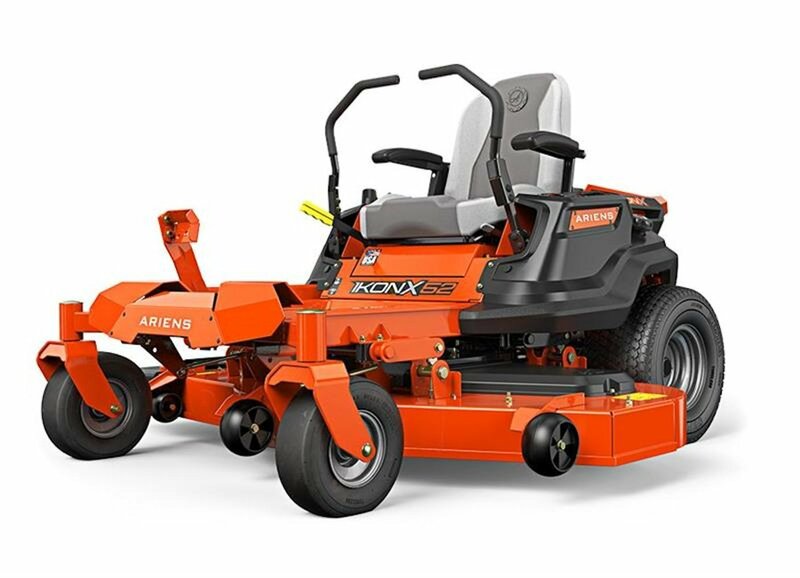 Additionally, the mower is equipped with high back comfort and armrests that grant great operational comfort, while the padded levers significantly minimize vibrations during operation. The mower doesn’t come with a mulching set. This is quite disappointing really, as some of the Ariens models like the 34 Kohler 6000 series comes with its own set of mulching blades and bag. Even with the zero turn feature, steering on bumpy and undulating terrain was rather tricky. Wheels tend to slip on marshy ground. 52” deck size may not be ideal for smaller yards. Needless to say, it wouldn’t fit through a small standard lawn gate, to begin with. Will I be able to use this mower for home use? The Ariens IKON-X 52 is not just for professional use but is built for regular backyard trimming as well. But make sure that the yard is not a very small one, as this mower is rather big in size. Will the mower work on inclined lawns? The wheels and the extremely powerful engine support effortless inclined slope trimming. But for marshy and undulating surfaces, much of the wheel traction and stability can be lost. Must I turn the mower 180 degrees every time I need to mow back? Absolutely NOT! As the IKON-X 52 comes with a zero turn feature, it will allow you to mow in reverse without having to give the mower a 180-degree turn. But it’s important to be aware of obstacles behind, and a reverse mow should only be done when necessary. Are there uncut stripe areas between the blades? No! The 3 blades are staggered and kept so close together that even though they don’t touch, their cutting areas overlap and leave no uncut stripe behind. The Ariens IKON XL 52” Mower is just perfect for efficiently manicuring medium to large sized yards with ease. 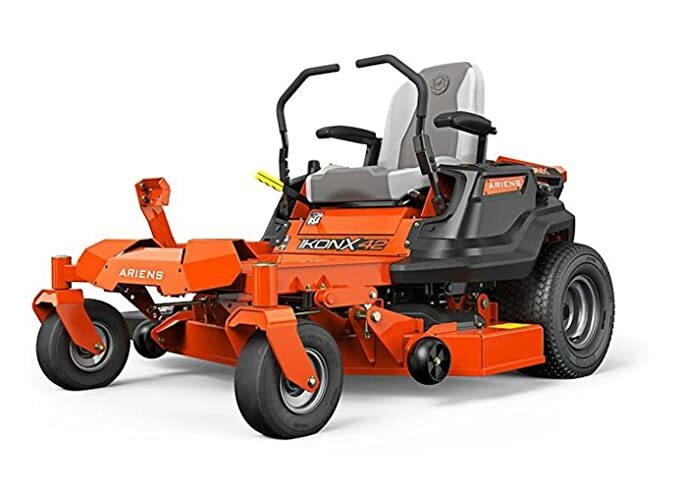 It comes with a powerful high quality 24 HP 700 V-Twin KOHLER engine that makes quick work of the most difficult of grass trimming jobs. Apart from the power, what I absolutely loved about this mower is the grass trimming efficiency and the ease of use. The commercial grade hydro-gear ZT-2800 Transaxles makes it one of the most precise and consistent lawn care instruments in the market. The transaxles provide an increased torque that not only allows the mower to move twice as fast as most of the other standard models but provides great control and precision as well. Along with the plush high seat, it makes the cutting process very smooth and the mowing experience comfortable, and doesn’t allow me to feel a single vibration even when trimming on rough, uneven ground. The easily adjustable cutting height makes the mower very versatile and perfect for use for both professional and domestic purposes. However, controlling the mower at the highest speed on extremely bumpy terrain is rather difficult, and it also tends to clog when you cut a lot of wet grass with it. The Ariens IKON-X 42 is all about delivering professional lawn mowing capabilities at your very doorsteps. But even with the premium grade build, don’t think for one second that the mower has a high price tag in any way. And if all my experience in lawn mowing is something to go by, then I would say that the IKON-X 42 is one of the more affordable models in the current market. It comes with a fantastic 18 HP Kawasaki V-Twin engine along with a fully fabricated 42 inches deck which is exceptionally tough and durable. However, even with the sturdy build, Ariens has not compromised on comfort at all; the IKON-X 42 is relatively easy to use and has a kind of unique long term consistency which not many models of its class can provide. So, why should you go for this mower? To start off my review, let me first talk about this mower’s durability. In my experience a mower needs to be as sturdy as possible; it needs to be able to traverse through rough terrain with undulating surfaces and cut grass consistently throughout long mowing sessions without any issues. And the Ariens IKON-X 42 achieves just that and even more. I was using this mower for a golf course trimming job recently, and even after 3 hours of mowing under the sun, it kept on going strong. These capabilities of the mower are only possible because of the 22 HP V-Twin KOHLER 7000 series engine that it comes with. The engine along with the incredibly durable body allows the IKON-X 42 to effortlessly move over rough and bumpy terrain effortlessly. If you have a very unruly and uneven backyard, then the IKON-X 42 might just be the right pick for you. When you’re investing your hard earned money in a lawn mowing tool, won’t it be a terrible sinking feeling when the mower you bought doesn’t cut different grass lengths consistently? I know I would be furious if my mower starts to cut unevenly, and would obviously lead me to write a scathing customer review on the online portal. However, the IKON-X 42 is one mower that ticks all the boxes when it comes to grass cutting and user comfort. What makes it such a fan favorite is the dial operated height selector that is installed on to the deck. This feature allowed me to set the exact cutting heights that I required; and between 13 different cutting positions ranging from 1.5 inches to 4.5 inches, I was able to easily adjust it to the type of field I was working on. This aspect makes the mower incredibly versatile as a gardening tool, and along with the twin EZT hydrostatic transaxles, It significantly improves user control by making the cutting experience smoother and hassle-free. Additionally, if you want to equip your mower with a bagger for mulch, the IKON-X 42 comes with a receiver hitch mount as well. This will allow you to attach a bagger or any other tow-behind accessory. The only disadvantage for me is the deck size. Sure, a 42” deck might scream comfort and fast mowing capabilities, but more often than not this size can be a hindrance for lawns which have a lot of fences. And forget about cutting close to a fence. The IKON-X 42 might just be small enough to fit through the tight spaces, but cutting along a fence can be very problematic. A wider deck would have been a better choice in such situations in my opinion. Will I be able to equip a bagger with the Ariens IKON-X 42? Of course you can! The Ariens IKON-X 42 comes with a standard receiver hitch mount which makes it bagger-ready. You can even use the receiver to attach other tow-behind accessories as well. How much is the inclination rating of the mower? The inclination rating of the mower is at 15 degrees. But on certain slopes, it can go a bit further than 15, but I would not recommend that you do that much. What octane fuel is advised for this mower? It’s best to use unleaded fuel with an octane rating of at least 87. Make sure that you avoid E85 blended fuels as it might harm the engine. Not many lawn maintenance equipment can strike a proper balance between precision, design, and durability. And this fact is especially true for lawnmowers. While one design boasts power and cutting potential, another model deems ease of use and comfort to be the number one priority. However, this is not true for the Ariens Apex 60; it’s one mower which I find to be at the top of its class. Packed with some of the best commercial features, this lawn mower comes with a 5 ½ fabricated deck design and a CBT (constant belt tension) system which makes it one of the most durable machines in the market. I had the fortune of trying this mower out for myself in a very tough lawn job recently, and I was quite surprised to find how it was able to hold out through all the rough use I put it through. So what separates the Ariens Apex 60 from the rest? The fabricated deck design of the Ariens Apex is backed by a tubular frame which is made out of industrial grade 10-gauge steel. This provides the machine with a very sturdy backbone. As the Apex is all about bringing a professional cutting performance to your very doorsteps, Ariens finds it necessary to equip it with CBT (constant belt tension) system. And believe me when I say that without this mechanism, this mower wouldn’t have been able to provide me with half as much of a thorough job as it was able to. The CBT allows the mower to minimize wear and heat while at the same time providing improved belt life, thereby minimizing the need for adjustments in undulating and rough terrain. What makes the Ariens Apex such a fan favorite is the “intuitive foot-operated deck lift system”. No lawn can have the same amount of wild grass growth throughout its surface, hence this system comes especially handy when you need to change the cutting height, position, and increments. With just some pressure from my foot, the mower allowed me to easily adjust between 15 different cutting positions in 1/4 inches of increments. Another aspect of the mower which I really liked is that it allowed me to work for hours under the sun without showing a single sign of overheating. The aluminum spindles which are incorporated into its design significantly reduces the bearing temperature for a much cooler operating experience. And along with the “Hydro-gear ZT-3100 commercial grade transaxles”, the mower is given an increased torque and load capacity for lesser piston vibration and more mowing control. Moreover, the Ariens Apex also comes with a flip-up side discharge chute that helps to reduce the damage, which the mower can otherwise impart to the surrounding environment. And the adjustable high-back seat has padded armrests to provide additional support and minimize fatigue during long mowing jobs. To start with, let me just say that the Apex makes a lot of noise and is not neighborhood friendly in that manner. There were way too many rattles especially from the electric clutch after I turned off the blades. During operation, the deck seat vibrates a lot even though the pistons don’t vibrate much, but that is only when I crank up the mowing speed. The seat, though comfortable is not built as durable as the rest of the mower, and it started showing signs of wear after just a few days of use. How well will the Apex fair on steep hilly lawns? The mower will be fine as long as the steepness is within the 15-degree mark. For slopes with angles beyond 15 degrees, the mower will start to slow down and stop working after some time. Will I get a bagger with this mower? For availing the bagger feature you will have to buy a completion kit separately, and then install it on the mower which is quite easy. 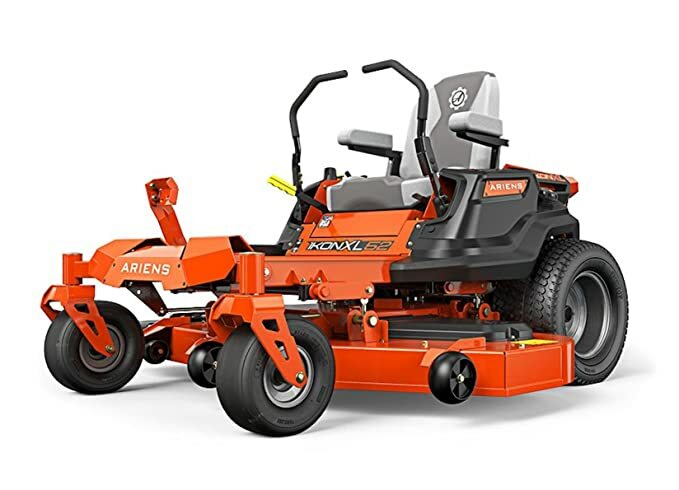 The Ariens IKON-X 52 Zero Turn Mower absolutely screams ease of use and versatility. And for that price range, it truly is one of the most pocket-friendly and value for money lawn mowers out there in today’s market. 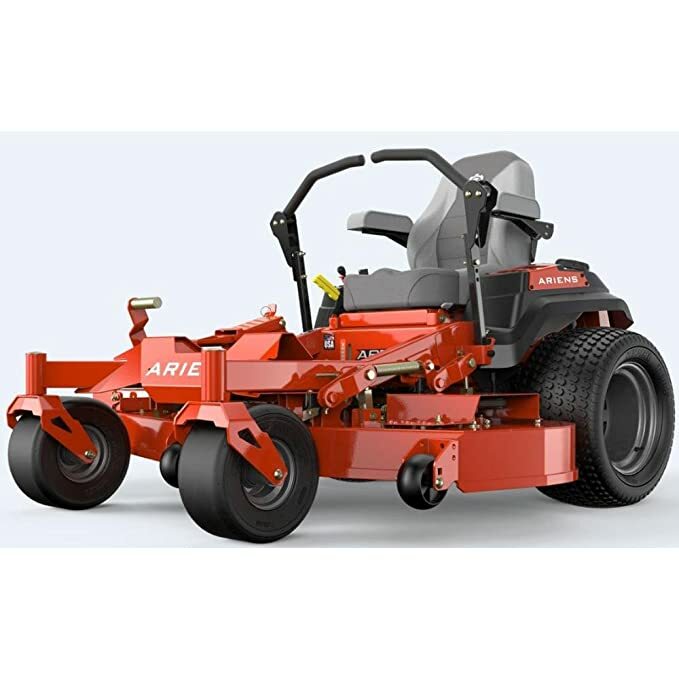 However, even though it might have a few cons in certain areas, I hope that it is your mower choice of the day as well after reading our Ariens mower reviews.